There are many items vying for your hard-earned dollars each day. “Must-have necessities” such as a big-screen, smart televisions, appliances that tell you when they need service and other high-tech gadgets capture your attention and provide short-term gratification for a job well done. Unfortunately, the appliance you really should pay attention to is often overlooked until it’s too late; a sump pump. The sump pump, while not terribly glamorous, provides tremendous peace of mind for homeowners that is unmatched by any other piece of equipment. Rain and snow saturate the ground around and below your home’s foundation. Hydrostatic pressure causes a build-up against the concrete walls and will either cause cracks or overwork your drainage system. To relieve this pressure, a small pump is installed in the lowest part of a basement to keep the space under the building dry and prevent flooding. Typically, it’s installed in a pit or crock below floor level. The reservoir has a gravel base and is generally about two feet deep and 18 inches wide. Water enters the area through drains or natural migration through the soil. As water fills the pit, a float activator arm or pressure sensor turns the sump pump on and moves it through a pipe away from the house. Centrifugal force triggers an impeller to spin and forces water to move out through the pipe. Most household pumps run on standard electrical power and require a ground fault circuit interrupter to prevent accidental electrocution. 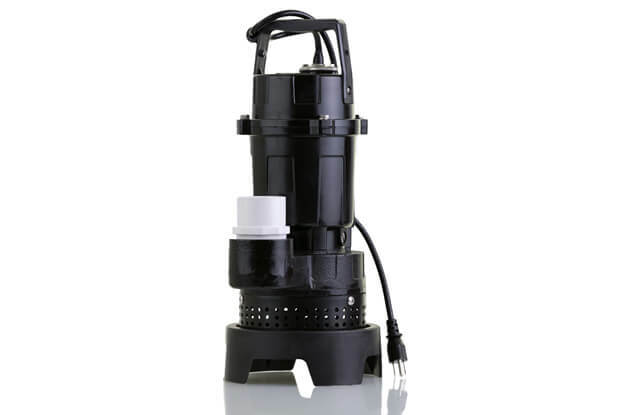 Two sump pump styles are available, pedestal and submersible, and both move water safely out of the basement reservoir to an area outside your home. There are pros and cons of each type that should be considered before purchase. The pedestal unit is split into two pieces and utilizes a stand-alone motor attached to a pole. 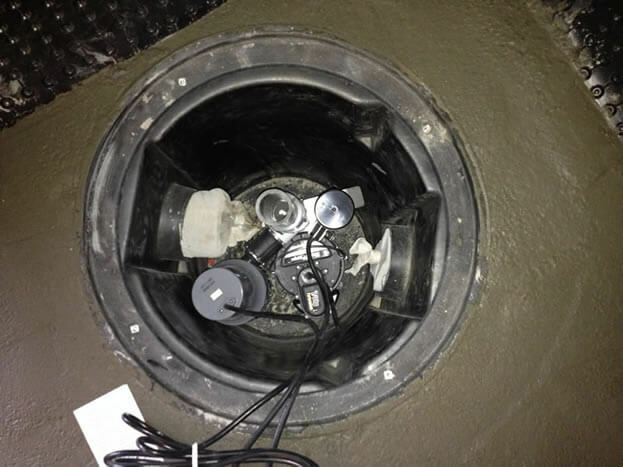 It is installed above the basement floor with a hose or inlet pipe that reaches to the bottom of the sump pit. They are fairly inexpensive and usually last longer than submersible types. As the motor remains above the water level, it is not susceptible to water damage. This means the motor is exposed and will be noisy during operation. This may be a concern if the basement is finished. However, any repairs to the motor are usually inexpensive, as the basement floor will not need to be torn up to access it. While pedestal styles are cost-efficient and very reliable, they are generally inadequate for moving large volumes of water. They typically come with a 1/3 horsepower motor and pump 35 gallons per minute. Heavy rainstorms may cause basement flooding, as this type of sump pump wouldn’t have enough power to pump the water out fast enough. This style utilizes an integrated design that combines the motor and pumps inside a waterproof housing. It is placed in the sump crock and designed to get wet. The pump is positioned at the bottom of the unit and an outlet pipe on top. A grate on the bottom keeps debris out. The pump is activated with a float unit and an impeller turns on to route water into pipes and outside. As it is placed inside the reservoir with a cover, the pump makes little noise. These come in sizes up to 1/2 horsepower with a pumping capacity of 60 gallons per minute, which is faster than a pedestal type. They are also much more expensive and difficult to repair as access is limited inside the sump pit. As with any important appliance, you’ll want to make sure your sump pump is always in perfect working order. Below are a few tips to protect your basement from potential flooding. When the water in your sump reservoir reaches a certain level, the activation switch turns the pump on. Vertical styles are most popular for efficiency and reliability but they also come in electronic, tethered and diaphragm types. Heavy use will likely produce breakdowns and may require replacement. With the loss of power being a common problem, purchasing a battery backup unit will offer continuous protection. In addition to power outages from storms, the cord could be accidentally unplugged or the electrical circuit tripped. Back-up units range in cost but are generally a wise investment for the added level of flood protection. It’s recommended that a check valve is installed in the pipe between the pump and outside discharge. This will stop water from backing up into the impeller and causing it to unscrew. To relieve pressure in the discharge line, drill a small hole. This will help extend the life of the sump pump. The correct horsepower and pumping capacity for your application will extend the life of your sump pump. A unit that’s too small will work too hard and burn out quicker, and too large a pump may blow the seals by exerting too much pressure. Also, check the vertical lift capacity before buying one to be sure it is sufficient for your needs. -During dry periods, pour water into the pit to run a full cycle. -Run vinegar through it to remove build-up. -Make sure the float is unobstructed and working correctly. -Make sure water is being pumped out. 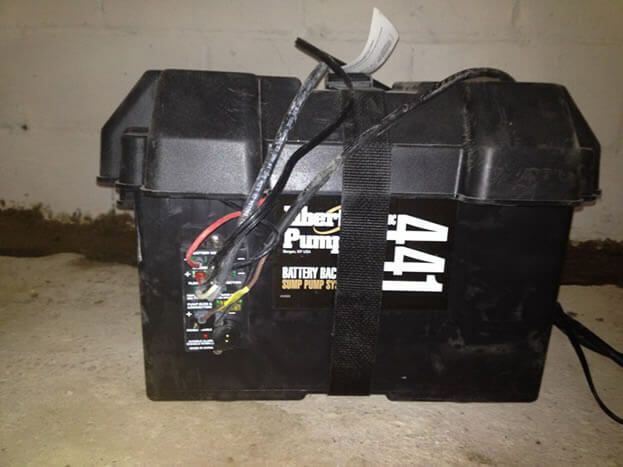 -The battery back-up pump should be replaced every three years. -Listen for odd motor noises if it won’t shut off.